NEW! One-click Access to our Journals directly through your NDEO login. No need to log in separately to the Taylor and Francis website and remember multiple logins. Click below to access. 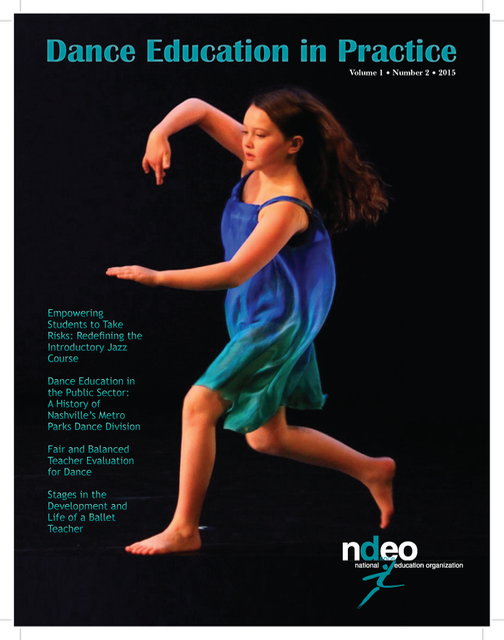 NDEO administers two publications: Journal of Dance Education (JODE) and Dance Education in Practice (DEiP), and is a managing partner on the Arts Education Policy Review (AEPR). The need for two NDEO journals is readily apparent when considering the breadth and diverse needs of the field of dance education and NDEO’s expanding membership. The journals are intended to complement one another to best illuminate contemporary issues in dance education, teaching, and learning. However each journal is uniquely distinct. The following responses to two often-asked questions can guide readers in their scholarly and pedagogical usage of the journals while also assisting those interested in publishing. What are the similarities and differences of each journal's articles? DEiPhighlights practical approaches to dance teaching and education in respect to numerous and diverse teaching settings. Each issue includes articles (1,000-3,000 words) by educators about what they do in the studio and classroom. Columns on resources for dance teaching, current trends in the field, and viewpoints from dance educators and students enhance feature articles. JODE emphasizes practical and theoretical aspects of dance education by scholars and practitioners using a wide range of research frameworks and methods. JODE issues include feature research-based articles (5,000-8,000 words), in practice articles (1,500-3,500 words) focusing on applied theory and teaching approaches, and student readings articles (1,000-3,500 words) geared towards specific student populations in order for teachers to share with their students. What is each journal's review process? Both journals receive manuscripts electronically through ScholarOne. This allows each journal’s editorial board to facilitate a meaningful review process. Substantive comments, regardless of publication decision, are provided to all authors.DEiP's process begins with a blind screening by DEiP editorial board members. Authors whose work is chosen to move forward receive one-on-one mentoring with an editorial board member, working collaboratively to bring the article to publication readiness. JODE engages in a rigorous blind peer review process, in which the editor sends articles to be double-blind reviewed by a panel of three national and international scholar-practitioners in the content area of the article. Feedback given during the review process supports authors in their revision writing. Please click on the respective link to each journal for more details. Inquiries can also be sent directly to each journal’s editor.